It’s that time again when I am itching to try out new recipes, and today we have few courgettes in the fridge and fresh thyme….alarms bells starts ringing. These two make a great combination in savoury dishes, so why not try them in something sweet. Herbs bring instant life to a dish, and you would be surprised how this works. I guess we associate herbs in mostly savoury dishes, but trust they are equally good in sweet dishes as well. As we already know herbs have great health benefits so adding extra to something already healthy with fresh vegetable can only create something rather special and good. With added sweet muscavado sugar for that rich molasses taste brings more dimensions to this cake. It is super soft, moist, with a very delicate flavour of thyme in the background. You must try it out – surprise but you won’t be disappointed. Preheat the oven to 170C/150C fan/gas 3. Grease and line a loaf tin. Grate the courgette, carrot and put in a large mixing bowl. Sift the flour, baking powder and bicarbonate of soda in a bowl. Place the thyme and sugar in an electric blender and blitz to combine. You can o this in a mortar and pillar. Beat the eggs in a large bowl, and then add the oil and sugar until light. 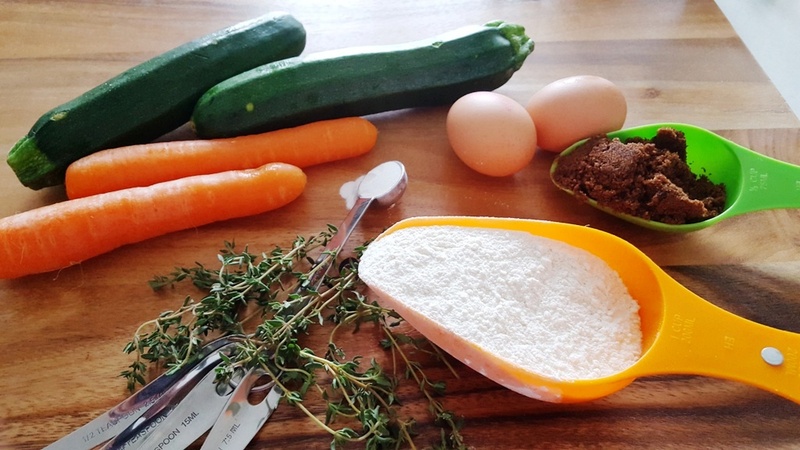 Using a wooden or large metal spoon gradually fold in the flour in the egg mixture until well combined. Pour the mixture into the prepared loaf tin, smooth the surface and bake in the oven for 45 minutes, or until a skewer inserted into the middle comes out clean. Remove from the oven and allow the cake to cool in the tin for about five minutes before removing. Cool completely on a wire rack before putting the creamed icing. Meanwhile prepare the cream cheese by beating the cream cheese and butter together in a bowl until well combined. Add the fresh thyme leaves and icing sugar and mix until the icing is smooth and thick. Using a palette knife spread the cream cheese frosting over the cooled cake; finish off with a few sprigs of fresh thyme. 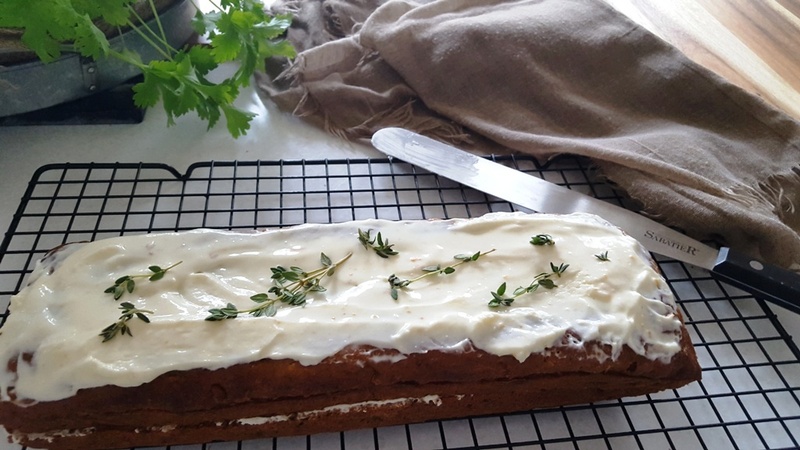 Brinda’s Note: Instead of topping with cream cheese, you can top the cake with a lime and thyme drizzle sirop.